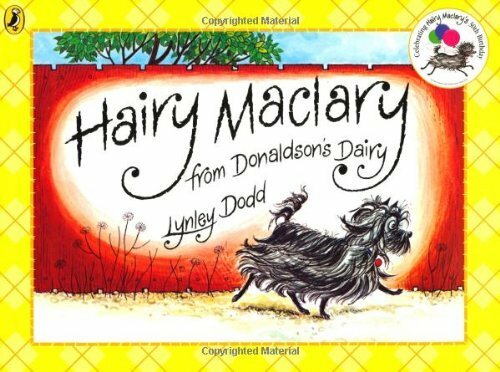 Booktrust are giving away a copy of Hairy Maclary from Donaldson’s Dairy to every child starting school in the UK in 2014 /15. We have several Hairy Maclary stories, their bouncy rhythm makes them lovely to read aloud and the repetition is great for beginner readers. Hairy Maclary’s canine friends appear in several of the stories as does Scarface Claw, the tough Tomcat. The Story: Hairy Maclary leaves Donaldson’s Dairy to go for a walk. Along the way he is joined by friends Hercules Morse, Bottomley Potts, Muffin McLay, Bitzer Maloney and Schnitzel von Krumm. They walk together through the town until they meet Scarface Claw who scares them by yowling loudly. But how do Hairy Maclary and his friends react?. This is a very simple story. The dogs go for a walk, are scared by a cat and then run home. However, despite the simplicity of the story the rhyming text is full of rich vocabulary. It has a wonderful variety of adjectives to describe the dogs and some great verbs describe what happens on their walk. Every dog is a different breed and a short rhyming sentence combined with a picture describes each one perfectly, for example, Bottomley Potts…………. spots. The dogs names are really original, my favourite is Schnitzel von Krumm (can you guess the breed from the name?!). The double spreads have a picture on the left and text on the right. Sentences don’t always finish on a page but meander onto the next one and when the story is read aloud children enjoy joining in with the repetitive text. The repetition is reminiscent of the shopping game where children have to remember the order in which things have been bought. With Hairy Maclary children can recall the order in which the dogs are introduced (there is only one dog introduced in each picture so they only need to remember which dog came before). The Hairy Maclary books are great to use in the literacy classroom and not just with younger readers. I have given older children an extract from the text and they have highlighted adjectives with one colour and verbs with another. They substituted their own verbs and / or adjectives and wrote a short rhyming sentence about a dog breed of their choice. Each sentence, with an accompanying picture, was included in a class book. Hairy Maclary and friends have their own website. Two other stories that we enjoy are Hairy Maclary’s Rumpus at the Vet which tells the story of the chaos that ensues in the vet’s waiting room when Cassie the parrot pulls Hairy Maclary’s tail. In Hairy Maclary’s Bone his friends follow him around town after the butcher has given him a bone. Hairy Maclary manages to lose them one by one until he can go home and enjoy his bone, alone! Lynley Dodd is an internationally celebrated writer for children who was born in New Zealand. She started as a book illustrator. This book Hairy Maclary is so well known and loved and probably what made her famous, don’t you think? In 2002 she was made a Distinguished Companion of the New Zealand Order of Merit for her services to children’s literature. Last year we had a stage play at the Opera House about Hairy Maclairy – quite a famous dog. It’s fantastic that Booktrust are giving away a copy of Hairy Maclary to every child starting school. I think that Lynley Dodd is most famous for Hairy Maclary but my daughter also loves ‘My Cat Likes to Hide in Boxes’. It’s fantastic that her books have travelled so well. Such a fun title! I haven’t had a chance to read any of these books, but will be checking them out. Thanks for sharing! I’ve never heard of Hairy Maclary. Thanks for sharing this series with all of us at the Kid Lit Blog Hop! Hairy Maclary comes from New Zealand but he’s very popular in the UK. I love your picture book reviews! This sounds like a charming story for dog lovers of any age! Thanks for sharing it at the Kid Lit Blog Hop! Great coverage. I’m so excited to be bringing Hairy Maclary events to libraries all across Kent to tie-in with this exciting Booktrust initiative http://readingfairy.com/readingfairyandhairymaclary/ Coming to libraries across Kent from Oct-Dec 2014!